Degrees and radians are the two types of units to measure angles and are frequently used in high school math. 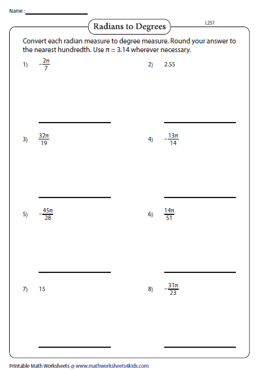 This plethora of worksheets specifically deals with the conversion of degrees to radians and vice-versa. 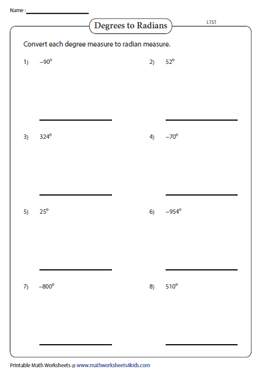 Students will be able to perceive and swiftly convert degrees and radians by practicing these worksheets. The worksheets are classified into two levels of complexity. This pretty easy conversion of degrees to radians worksheets encompass degrees that lie in either of the four quadrants; multiply each degree measure with pi and divide by 180° to get the radian. 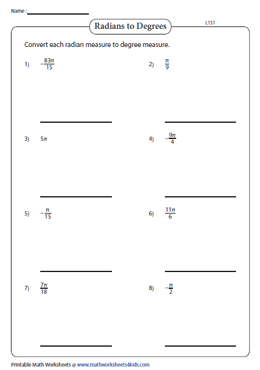 Raise the level with this set of worksheets. Convert the degree to radian, plug in the value of pi viz. 3.14, to obtain the approximate value and round off the answers to the nearest hundredth. The process to convert a radian measure to a degree is quite simple, multiply radians with 180° and divide by π. The degrees, thus arrived are in the integers. 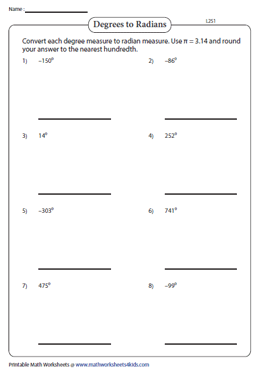 Reiterate the concept of conversion between radians to degrees with this set of worksheets. Substitute the value of pi, and then round off the answer to the nearest hundredths. This collection of revision worksheets comes handy in testing the knowledge acquired. 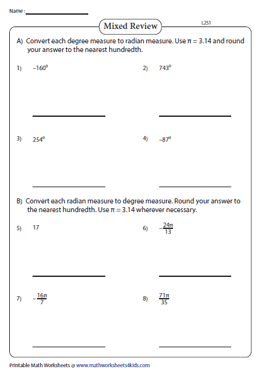 Each worksheet features two parts - convert degrees to radians in Part A and radians to degrees in Part B. 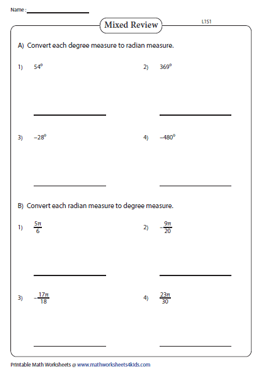 This set of Level 2 worksheets requires learners to convert radians to degrees and vice-versa by substituting the pi value. Answer key is included to validate your responses.